Well Happy New Year everyone, hope you all had as good a time as we did. 4 days in Germany, a masked ball on New Year's Eve and a cold to bring home as a souvenir. It was suggested that we did fancy dress as well, but gettting the masks and the posh frock and DJ there was enough for us, and no one else wore fancy dress so it didn't matter. I did have some more pics of the holiday, but they are on my phone and the battery is almost flat. So what is on my worktop today? Well unfortunately my worktop contains several bereavement cards, three of them and a birthday card, and I have another two bereavement cards to make in the morning. At the back you can see a pink elephant, no I haven't been at the juice, tempting though it might be, well I have a bit but not that much. Pink elephant was a template for a birthday card for a one year old. 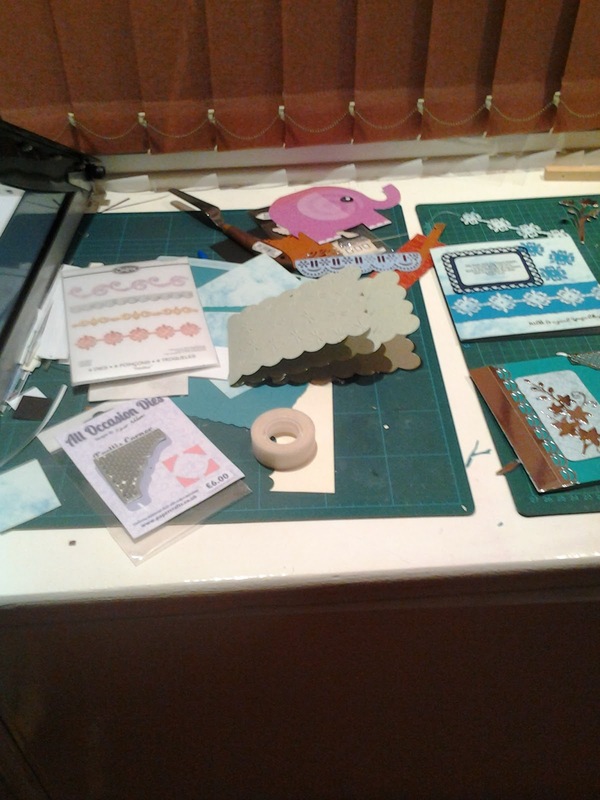 You can see elephant better here and some die cutters I was using to make cards. I particularly like the corner cutter but didn't realise that it cut the mesh but didn't cut out the piece as well, but it wasn't difficult to cut out the shape. There is also a set of Sizzix border dies which are also some of my favourites at present. 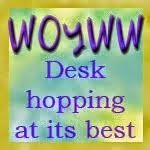 If by any chance you're wondering what I am on about and why this post is called WOYWW, pop over to Madame Julia who hosts this wonderful forum, open to anyone, when we can snoop at other crafters worktops and see how wonderful their creations seem to be compared to our feeble efforts, but it encourages us all being part of the 'family' who visit most Wednesdays. Well I must be off, cards to make, ironing to do, brute to feed and the hairdresser is coming to try and make my hair look less like a bad wig and more like normal hair. Miracle worker she will need to be. Bless you all and hope 2014 will be good for you. Wow, thats a gorgeous frock Mrs! Those corner cutters are a bit counter intuitive aren't they.. trying to get your head around what cuts and what doesn't! I;ve fixed on e link and deleted the other...a missing www. for some reason! I tell you, it's not blogger and linky's finest day! Hi Chris. Sorry you have so many bereavement cards to make - travel safely when you go South! 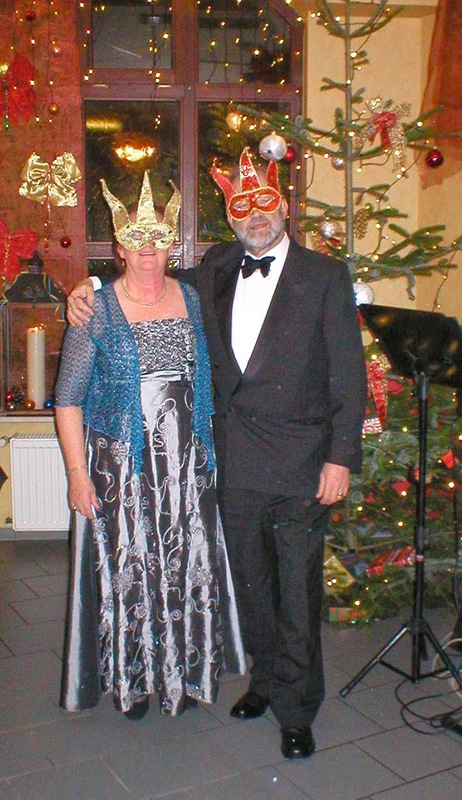 you and your DH look wonderful in your lovely clothes and masks I hope the ball was a great time for everyone. Thanks Ria, Although two cards are for my son in law and his parents, His grandmother died after a long illness, so technically family, I didn't know her at all. The other one is for the husband of a very dear friend who died on NY eve, and that is the one that hit me hardest. But when we get to senior citizen status, our friends are going to be leaving us sooner than we would likeand we just have to accept it. Your dress is gorgeous!!! (I'd never get hubby to do a ball of any kind.) So sad how we all must make sympathy cards. I live near a retirement area and it just breaks my heart. Anyway, hope your hair behaves and have a wonderful WOYWW! Thank you for your earlier visit - I have not idea what to do with those cards, the ones I have Gessod I am going to alter for an 'Alice' swap. Those 'Royals' are just so vibrant and beautiful IRL. Love that photo of you both in your masks - how exciting!!! Shame about the cold .... stay warm and craft is my remedy!!! Well, you scrub up nicely!! What a fab photo if you both, glad you had a good time. Love your selection of cards, you've made good use of the bad weather crafting! Oh, so sorry about the breavement cards. No matter how prepared we our for someon's passing, it's just always difficult. Although I do know that people truly appreciate knowing you are thinking of them. I LOVE your masks...what fun. Hope you get over your cold soon, and you are back at the desk. Oh my, so many bereavement cards already! It does not sound like your uear is starting off well. Lets hope it get better from here! Your desk looks great and I love the pink elephant. Sympathy cards are so hard to make -- and it sounds like you've had a run on them. Your desk looks nice, though, and love the pink elephant card. Perfect for a one year old! Sounds like you had a great time at the ball,. 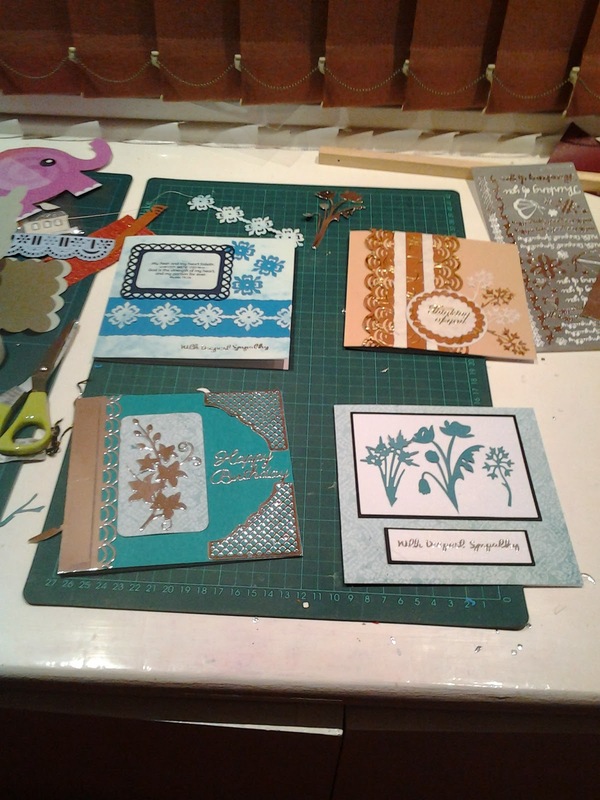 Sympathy cards are difficult to make, but they are appreciated..
You make beautiful cards. One year, I hosted a card swap (even though I'm not a card maker). Bereavement cards were the most requested, because they are so hard to make and the sentiments are often not ones people would normally buy, like they do birthday and Christmas sentiments. Looks like you had a good time at the ball in Germany. I'm a bit late, but happy belated WOYWW from #5.